The 10 Best Apple Orchards in Kentucky! With the season changing from the heat of summer to the coolness of fall, few things wake up the senses more than the smell of a fresh apple pie baking in the oven. Below are 10 of the best places around Kentucky where you can find orchard-fresh produce like apples, peaches, and pears. Some places listed allow you to pick your own, while others pick for you. Either way, you’ll get to take home your own farm-to-tables choices for great autumn desserts. Drawing from family experience spanning several generations, Hinton’s Orchard & Farm Market in Elizabethtown, Kentucky, was started in 2006, when the first apple and peach trees were planted. Now the orchard and farm market have developed into more than 25 acres of strawberries, pumpkins, melons, and other vegetables, hundreds of apple, peach, and pear trees, and a large greenhouse for flowers and other plants. The orchard celebrates each season with a festival where you can pick your own fruit or purchase it in the market. It was in the early 1900s that the Bray family started growing fruit and vegetables and they’re still going strong more than 100 years later. In addition to the picked strawberries, tomatoes, peaches, nectarines, and apples, they also grown and sell a nice variety of herbs, perennials, annuals, hanging baskets, and landscaping trees and shrubs. Stop by for some homemade ice cream when you’re done picking out your fruit and vegetables. There’s nothing sweeter than biting into a fresh peach right off the tree. That’s what you’ll find at Mulberry Orchard in Shelbyville, Kentucky. This family owned farm was been offering the best in fresh produce, local honey, eggs, meats, apple cider, and a great selection of jellies and fruit preserves for many years. With a passion for produce and solid farming techniques, owners Matt and Amanda Gajdzik started with 3,000 apple and peach trees and a desire to offer great produce and let others see how a working farm operated. The farm is open five days a week, and they love to have school groups and tours. Offering u-pick apple varieties that include Gala, McIntosh, Cortland, Mutsu, Stayman Winesap, Granny Smith, and Fuji, Reed Valley Orchard in Paris, Kentucky, also has pears, peaches, blueberries, black raspberries, pumpkins, Indian corn, and gourds. Open every day except Sunday and Tuesday, this orchard has been in operation since 1988, when the first fruit trees were planted. Proud sponsors of the Back Forty Nature Walk & Country Festival held in October, they also have a quaint country store that sells candy, apple cider, slushies, and other items. Reed Valley Orchard is perfect for a family outing or a school field trip. Ayres Family Orchard located in Owenton, Kentucky, has been serving their local community for over 25 years. This beautiful family-owned farm and orchard is well-known for having over 40 different types of apples, and you can take some fresh apple cider home when you visit. Also offering blackberries, white peaches, plums, pears, and fresh jams, this little farm and market is a popular stop for the locals. A visit to this fifth-generation family farm will provide you with the opportunity to pick your own in-season fruit, see how a working farm operates, and enjoy family-friendly entertainment. Once a tobacco and cattle farm, vegetables, and apples were planted as alternative crops, and the farm has grown to over 175 acres with 15 of them being apple and peach orchards. The other vegetables are sold in the market on site and at other farmers markets around the area. If you’d like a fun family outing, you can pick-your-own strawberries, blueberries, pears, pumpkins, and apples, but be sure the check the picking schedule before you come. If you’re looking for a place where you can find fresh out-of-the-orchard fruit, live music, wine classes, a haunted hayride, and more, you’ll want to stop by Boyd Orchards in Versailles, Kentucky. The food, fun, and farm activities are offered year-round, and there are opportunities to pick your own strawberries and apples. For special family fun, the AppleFest is happening every weekend in September and you can learn how to make your own apple butter. Reid’s Orchard in Owensboro, Kentucky, has been built on the dream and innovative ideas of one family for over 145 years. Always on the alert for new and better techniques for raising crops grown on the farm, like apples and peaches, the Reid family has been on the cutting edge of agricultural technology, and the farm was the first in the state to use high-density apple production that resulted in nearly 1,000 bushels of apples being grown per acre. 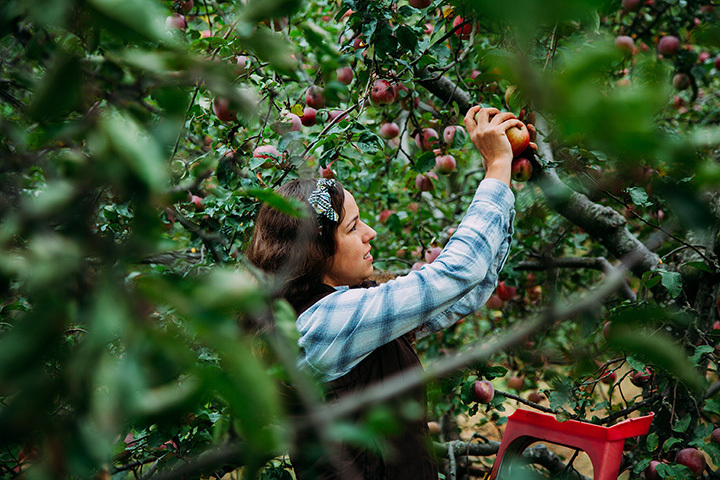 Today, there are a dozen apple varieties grown on the farm and a special Apple Festival occurs each fall in celebration of the harvest with activities for the entire family. Providing good food and good memories since 1966, Jackson’s Orchard in Bowling Green, Kentucky, understands the meaning of family. This 105-acre farm has over 7,000 apple, peach, and cherry trees and is open every day. Besides being able to pick your own in-season apples at a per-bag price or by the pound, the orchard is perfect for groups and birthday parties, and tours can be booked to showcase the working farm. There’s even a playground the young ones can enjoy. Located along the beautiful sprawling landscape in Nancy, Kentucky, Haney’s Appledale Farm has been around since the 1800s. Today, the 450-acre farm has over 25 varieties of apples, and 10 kinds of peaches, pears, and nectarines on another 70 acres. The family-owned farm has a Farm Bureau-certified roadside market that offers fresh apple cider, already picked produce, jams and jellies, and at certain times of the year, you can pick your own fruit. The market also has delicious pies, caramel apples, baked goods, crafts, flowers, and apparel.